Adaptive materials are able to react to changing environmental conditions. For example, they serve for active vibration damping and geometric stabilisation under alternating thermal and mechanical loading. From the wide variety of material combinations the paper regards carbon fibre-reinforced plastics (CFRP) laminates with thin piezoceramic sensors and actuators integrated into the composite. Non-destructive evaluation is aimed onto optimisation of manufacturing techniques and maintenance requirements. Fibre and resin distribution, actuator and insulation bonding and integrity, interlayer adhesion, absence of massive fibre breaking and impact damage are assumed to be most important quality parameters. Figure 1 presents the integration of non-destructive evaluation (NDE) into development and application of adaptive material systems. The scope of properties to be evaluated includes the inner structure of the composite (fibre orientation, ply sequence, sensor and actuator position, local fibre or epoxy concentrations), planar flaws oriented parallel to the surface (delamination, ceramic debonding), perpendicular oriented flaws (cracks of the matrix or of the plates) and volume imperfections (pores, voids, inclusions). NDE imaging systems should be able to visualise relevant structural parameters. The challenge results from the wide variety of physical properties of the components, their anisotropy  and the great differences in flaw geometry and orientation. Figure 2 introduces X-ray, eddy current and ultrasonic systems. X-radiation is appropriate to study both piezoceramic actuators as well as host material. Due to different mass attenuation coefficients different energies have to be applied. Consequently, it is not possible to examine actuator regions and pure CFRP regions simultaneously. One of the recent methods is digital X-ray imaging using radioscopic systems using minifocus tubes for high resolution. Versatile image processing routines improve presentation's quality. In contrast to metal components CFRP is characterised by very low and anisotropic conductivity . Therefore, high frequencies up to 10 MHz have to be applied to induce sufficient current density. Additionally, capacitive couplings between the fibres can be used at high test frequencies . Rotating non-axial EC probes are necessary to detect angular anisotropy. Static differential probes can be used to evaluate local inhomogeneities in fibre distribution . PZT (lead zirconate titanate) material of the actuators is an insulator and, consequently, can not be visualised directly. But the actuators are coated with copper-nickel alloy providing sufficient conductivity. This thin coating mirrors cracks in the ceramic plate making them visible for EC method. Special problems arise due to anisotropy, layered structure and heterogeneity in adaptive CFRP-structures . Wave modes with differing properties may occur depending on direction of propagation, polarisation and anisotropy . The material may be regarded as a combination of alternating layers (fibres in the matrix, epoxy layers, insulation layers, piezoceramic plates) of different thickness, density and elastic properties. At each interface partial transmission and partial reflection with different amounts depending on the acoustic properties take place. The interfaces produce a large number of echos, because multiple reflections and interference effects occur. Different types of waves and techniques are applicable for CFRP-structures, but normal incidence of longitudinal waves with evaluating the reflected signals admits detection of flaws in most cases. So, according to the material structure and flaw type the best suited ultrasonic technique has to be used. Significant differences between mechanical and thermal properties of the ceramic plates and the matrix demand sophisticated manufacturing techniques. Various damage mechanisms may reduce or even destroy the sensing and actuating capabilities of the piezoceramic material. Figure 3 shows results of inhomogeneous pressure distribution during autoclave curing. To simulate fibre and resin concentration, a patch was cut out of an inner CFRP layer and added in another place beneath the actuator. X-ray clearly brings up the crack lines caused by this procedure. EC additionally shows very small cracks and textile structure of the host material. US-C-scan is recorded from reverse and sensitively displays regions with disturbed layer structure. Another sensible point is the contacting of actuators because it also may damage them during autoclave curing. First kind of contacting are dedicated rovings (fibre bundles). Figure 4 presents the ply sequence around an actuator. Although being very thin and flexible, these rovings also lead to an inhomogeneous pressure distribution during autoclave curing. Local pressure concentration around the rovings may induce cracks in the ceramic plates. 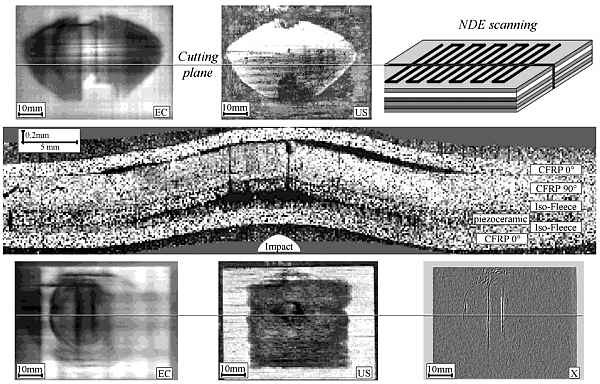 The NDE images are shown in the right part of figure 4. US-C-scan shows the contacting carbon fibre roving above and below the piezoceramic as bright and dark lines . This is even better visible in the US-B-scan which permits reconstruction of the layer structure in cross section plane. Here, the sudden changes in actuator direction indicate cracking. EC technique indicates good conducting metal coating of the actuator as bright square. Cracks can be seen as dark lines. X-ray image remains unaffected by carbon fibre material clearly showing both cracks. A second kind of contacting are dedicated windows in the insulation fleece as shown in figure 5. The conducting CFRP layer acts as the common wire for many actuators. The contact window causes an actuator deformation during curing. The resulting stresses deform the actuator and even may induce cracks. US-C-scan indicates this deformed area due to reduced time of flight of longitudinal waves. The degree of deformation can be measured in the US-B-scan with an accuracy up to 20 µm. Additionally, US-C-scan shows some branches of a crack and the contacting carbon fibre roving. EC image clearly makes visible the cracks and indicates the deformation as dark area due to the reduced distance between the actuator and the probe. X-ray image brings up the cracks but cannot detect the deformation. Impact load can cause delamination and actuator or fibre cracking. Two types of impact load have been investigated. First, high speed impact using Hopkinson technique and, second, conventional impact using a falling weight. Hopkinson equipment consists of a gas gun, a long incident bar (diameter 20 mm, length about 1 m), a transmission bar, the specimen loading system and the measuring system for transient gauge signals and piezo voltage (figure 6, middle left). By the impact of a projectile, a pressure pulse of short duration is generated in the incident bar. Once the incident wave reaches the interface incident bar-specimen, a part of the wave is reflected, whereas another part is transmitted to the transmission bar through the specimen. At the transmission surface of specimen, one part of wave is reflected, whereas another part is transmitted to the transmission bar through the specimen. The reflected wave is a tensile pulse, which interacts with internal interfaces and can cause actuator fracture, delamination and debonding depending on its amplitude. The incident pressure pulse produces a piezo voltage in the piezoceramic plate of the specimen. The pressure wave reflected at the transmission bar loads the specimen as tension wave. Interpretation of piezo voltage behaviour is most complicated due to wave interference. Using this loading setup, prepreg and DP-RTM (differential pressure resin transfer moulding ) specimens were investigated. Figure 6 shows some results of a prepreg laminate. Top diagrams present the piezo voltage during three shots. The smooth curve of the first shot (diagram No 1) with its typical beginning (high initial pressure peak - cut off due to preamplifier overload - and the negative tension pulse) is characterised by sharp voltage slopes after 130 µs. These slopes may be caused by local actuator breaking. After first shot, an eddy current image was recorded clearly showing crack lines starting from the terminals (conducting dye) and indicating a crack in the lower part of the actuator. Furthermore, a dark circle is formed in the middle corresponding to the incident bar. The metal coating is damaged due to actuator cracking. Starting from this circle, radial cracks are spreading. Caused by this actuator damage, second shot (No 2) provides a piezo voltage obviously differing from the first curve. The smooth form is lost, the peaks are lower. This behaviour is interpreted as a combination of actuator fracture and depolarising effects. Eddy current image after this shot proves crack growth and induction of new cracks. The ultrasonic C-scan shows a dark zone in the impacted area which is caused by higher attenuation of the acoustic waves due to actuator damage. Only small parts of this region are delaminated at the interface of insulation fleece and CFPR layer. Third shot (No 3) produces a piezo voltage clearly showing the increasing damage in the actuator. 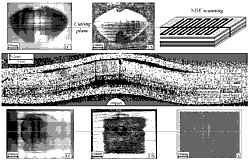 A last, a cross section was taken at the indicated line in the NDE images. Three micrographs are chosen showing typical damage structure. Vertical cracks in the ceramic plate are concentrated outside of the hit area. Horizontal cracks appear below the incident bar due to tensil impuls response. These small horizontal flaws scatter US waves and cause the display of damaged area in the C-scan. Bright spots in the insulation fleece above and below the actuator indicate voids resulting from its incomplete penetration with epoxy resin. These voids cause local stress differences leading to horizontal cracks within the piezoceramic. In contrast to prepreg system, the insulation fleece in DP-RTM system is completely filled with resin. Therefore, no horizontal cracking could be observed. Further impact investigation was conducted using conventional CFRP impact test. A 5 Joule impact was applied to the actuator region. Figure 7 shows EC and US images from top and bottom sides and, additionally, an X-ray image. The top views indicate a wide delamination between 0° and 90° CFRP layers. EC bottom image indicates cracks in the actuator and nearly a circular damaged zone corresponding to that of Hopkinson experiments. US-C-scan shows a rectangular shaped area between insulation fleece and actuator corresponding to a delamination which had its origin in a pore-enriched zone in the insulation layer. The X-ray image brings up two large straight cracks and a circular cracked area confirming the EC image. Fig 8: Blown actuator, non-destructive imaging techniques indicate burned areas in the ceramic plate (X-ray), areas of redistributed metal coating and cracks (eddy current), destruction of the material (ultrasonic). Figure 8 presents NDE results of a blown actuator. The electrical overload has caused burn out of ceramic parts spreading from one of the terminals (wire). Holes can be recognised in the X-ray. The EC image in its differential shows the termination and visualises the damage front starting from the upper terminal downward. Around this terminal was formed a chain of good conducting spots formed by the redistributed metal coating. Additionally, a crack on the right side becomes visible. US-B-scan proves a high degree of material destruction in different depths. The longitudinal waves are screened by delaminated areas and broken material being unable to transmit elastic waves. The micrograph validates severe damage of the actuator, the insulation fleece, the inner CFRP layers and their debonding. High resolution non-destructive methods are able to characterise manufacturing defects as well as defects induced by mechanical and electrical overload. The wide variety of physical properties of the components and their anisotropy demands a combination of different NDE methods. Eddy current, ultrasonic and x-ray techniques help to optimise the adaptive material system. Current research is conducted to qualify EC and US methods for infield application. Basing on these results, the future development is aimed onto direct exploitation of sensors and actuators for health monitoring of the material system.